I've created a buffet of tips, techniques, demos, and projects all about Chameleon Art Products! Join me for more creative fun! I first discovered Chameleon Pens on YouTube, of course! I fell in love with them immediately. I adore gradient color, and they made it look so easy! I thought, even though I had NO EXPERIENCE with alcohol pens and markers, that I could achieve beautiful results with these pens! Plus, I'm always up for exploring something new, so what did I have to lose? I started out by trying one, single pen, which I found on Amazon. I glanced over the instructions..they are super detailed, but I just wanted to get started...so, I glanced. And then, Inktober! I came across the Inktober challenge, and thought that would be a perfect way to draw and practice with my pens. I made my goal 'ridiculously achievable'! One very small drawing per day..very small. I learned so much, and it was amazing fun! Now, I am on a journey to incorporate these pens into my art journalling and mixed media work. ​ I just love these pens, and, in truth, I love the team over at Chameleon. They are so approachable, friendly, and supportive. Any question I asked, they took the time to respond to me personally. And so, I applied. I didn't know how it would go. There are so many outstanding artists out there...you just never know. I was over the moon when I got the message saying I had been chosen to be part of the 2017 Chameleon Design Team!!! So, as it turns out, my journey with Chameleon is just beginning. 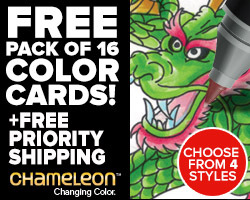 Chameleon Pens are an amazing pen that can create Multiple Color tones with just one pen! Please note, links to supplies may be affiliate links. That means that you are helping to support my website and art, at no cost to you. ​Thank you for helping me continue to bring you even more free content. I will NEVER recommend something that I do not absolutely love! Instructions, color wheel, swatching charts, etc. One of my favorite papers for Chameleon Pens. Also a favorite of mine, but a little heavier. Chameleon recommends Bee Marker Paper. I often use the Chameleon Detail Pen, Pigma Microns, Sharpie Paint pens, and Gelly roll pens with my Chameleon Pens & Pencils.